Protect The Health Of Your Loved Ones A sphygmomanometer is an essential gadget for every household. Whether you face blood pressure issues or not, either you are hypotensive or hypertensive, it really doesn't matter. A blood pressure monitor should be found in every medical supplies cabinet. Our stressful daily routines and constant anxiety have made it a necessity in order to keep track of our health condition in the best possible way. Blood Pressure Monitor You Can Count On Especially, as the years go by, the need to have a dependable blood pressure cuff becomes even more imperative, making the Paramed aneroid manometer the safest solution, with its convenient, clear dial and large discernible numbers. Along with the easy-to-use air-valve no adult will have difficulty in operating it. The Fullest Portable Aneroid Sphygmomanometer Kit Equipped with a professional stethoscope, all neatly packed and organized in a durable nylon pouch, you can get accurate readings in every home or clinical environment. A helping hand for everyone and a necessary tool for the health care professional. A COMPLETE BLOOD PRESSURE KIT: No need for you to waste money and time looking for a reliable stethoscope that will allow you to get a precise and accurate result. The Paramed aneroid sphygmomanometer kit will arrive full, accompanied by a high quality, professional stethoscope that will help you carry out the task in a proper and professional way. Everything will be neatly packed in a discreet, nylon carrying case that will allow you to take it with you everywhere. 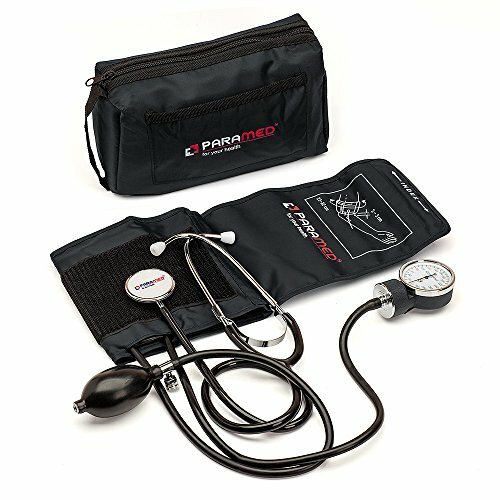 A BLOOD PRESSURE MONITOR FOR LIFE: Strong and durable, the Paramed manual aneroid manometer is equipped with pin stop movement, along with an extended universal blood pressure cuff 22-42cm, made of wear-resistant materials such as high quality latex and polyester, which, unlike PVC, is a solid guarantee of its durability. Moreover, the device owns a built-in filter which prevents dust from entering the device, a feature that makes this gadget way more long lasting than similar products. ACCURATE AND PRECISE: Specially designed to deliver clinical accuracy, with its metal gauge housing made of zinc alloy, along with the professional stethoscope, rest assured that you will be getting accurate and precise measurements, readings which you can rely on. The Paramed manual blood pressure monitor assures accurate and precise readings compared to automatic, bulky ones, which are very common to feature great inconsistencies. EASY TO USE: The Paramed aneroid sphygmomanometer with its clear dial makes reading the result a piece of cake. The large contrasting figures on the monitor makes it the most suitable manual blood pressure cuff for older people or people with low vision. Equipped with an air release valve, which can be operated using only your thumb, along with a convenient gauge holder, the Paramed manometer is ideal for everyone who wants to check their blood pressure either every day or occasionally. A TRUSTWORTHY MEDICAL TOOL FOR EVERYONE: Either you are a simple individual or a health care professional (nurse, medical assistant), the Paramed blood pressure cuff will assist you in getting reliable blood pressure readings, facilitating your job or everyday life. Portable and lightweight, it can be carried without causing any discomfort, so that you can take it with you while traveling, at work, at home, everywhere.